« Can Politicians Save the Welfare State by Urging – or even Subsidizing – More Baby-Making? While President Trump apparently intends to waste taxpayer money for more childcare subsidies and presumably is going to duck the critical issue of entitlement reform, there is some good news for advocates of limited government and fiscal responsibility. According a recent news report., he’s not a big fan of outlays for foreign aid. The White House budget director confirmed Saturday that the Trump administration will propose “fairly dramatic reductions” in the U.S. foreign aid budget later this month. …news outlets reported earlier this week that the administration plans to propose to Congress cuts in the budgets for the U.S. State Department and Agency for International Development by about one third. …The United States spends just over $50 billion annually on the State Department and USAID. Trump’s skepticism of foreign aid is highly appropriate. Indeed, he’s probably being too soft on the budget for foreign aid. Government-to-government handouts have a terrible track record. Indeed, the main impact of such transfers is to undermine good reform and enrich corrupt elites in poor nations. Moreover, if the goal is to actually create prosperity in developing countries, there is no substitute for free markets and limited government. Let’s look at some additional evidence about the harmful impact of aid. We’ll start with a rather amazing admission from a 2016 study published by the International Monetary Fund. Foreign aid is a sizable source of government financing for several developing countries and its allocation matters for the conduct of fiscal policy. This paper revisits fiscal effects of shifts in aid dependency in 59 developing countries from 1960 to 2010. …we show that upward shifts and downward shifts in aid dependency have asymmetric effects on the fiscal accounts. Large aid inflows undermine tax capacity and public investment while large reductions in aid inflows tend to keep recipients’ tax and expenditure ratios unchanged. …we find that the undesirable fiscal effects of aid are more pronounced in countries with low governance scores and low absorptive capacity, as well as those with IMF-supported programs. Wow, I’m not a big fan of the IMF, but you have to give the authors credit for honesty. They admit that aid is especially harmful in nations that are also receiving IMF bailouts. But the main takeaway is that foreign governments simply use foreign aid money as an excuse to raise and spend their own money. That outcome presumably should irk leftists. From my perspective, such nations have too much spending, regardless of whether it’s being financed by their own taxpayers or foreign taxpayers. Instead, these nations should be copying the small-government policies that enabled western nations to move from agricultural poverty to middle class prosperity. Let’s consider a couple of real-world examples. We’ll start in South Sudan, where aid has subsidized awful behavior. Ian Birrell explains in an article for CapX. …the fledgling state stumbles from the savagery of civil war into the horror of famine. …sadly these events also illustrate another example of the dismal failure of Western aid policies. …our politicians would be wise to stop spouting their usual nonsense about saving the world’s poor and start considering the corrosion caused by the billions already poured in to this failed state, pursuing naive ideas about state building based on floods of cash. …Experts such as the academic Alex de Waal say “looting food aid was elevated to military strategy” by militia commanders who later controlled the country. Despite these activities, $1 billion a year was handed over in aid in the years before independence, rising to $1.4 billion following arrival as the 193rd nation represented at the UN. …An estimated $4 billion was missing “or simply put, stolen”… But still aid poured in, leading to public spending per capita more than three times the levels seen in neighbouring Kenya. …there was a fake ministry of finance to deal with gullible donors and well-meaning armies of advisers, while the real version carried on under the generals with its backdoor dealings. …For all the fine words and good intentions, the West has ended up assisting and empowering a callous kleptocracy – again. 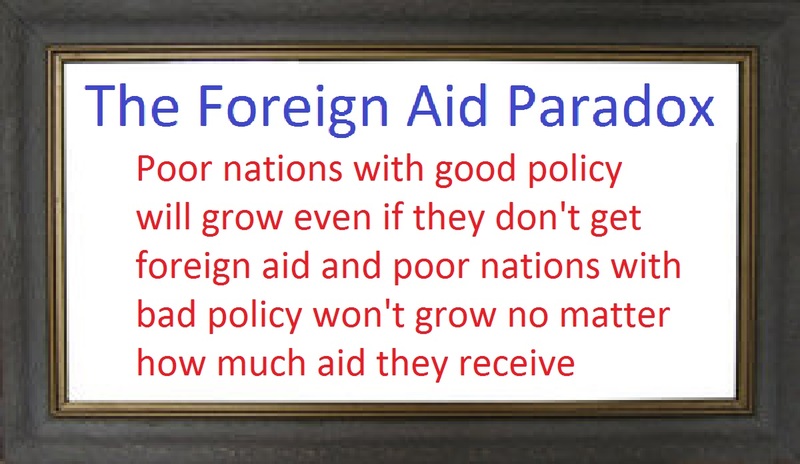 The bottom line is that foreign aid enabled and subsidized an awful government doing awful things. Now let’s look at another African jurisdiction, only this one has been neglected by the international community. But as Negash Tekie explains in another article of CapX, benign neglect can be a positive thing. Over the years, the West has spent many millions to help stabilise the Horn of Africa, and alleviate the grinding poverty of many of its residents. …In Somalia, meanwhile, the international community is still trying – as it has for decades – to build a functioning government. Yet despite massive amounts in aid, …there is little hope of either building resilient and inclusive state institutions. What a stark contrast there is with neighbouring Somaliland. …Somaliland is, admittedly, desperately poor… But it is, in a volatile region, a beacon of security and stability. …Somaliland…claimed its independence from Somalia in May 1991, amid the chaos of the civil war there. But international bodies, and the African Union, have refused to recognise it. But this absence of recognition has been a blessing in disguise. The result has been that, without international aid and support, Somaliland has had to fall back on its own resources. In contrast to other African nations, state-building programmes and public services have been entirely financed by domestic income, rather than being supported by international donors. …countries that are dependent on aid can afford to neglect tax collection, countries without it are forced to use taxation appropriately. In 1990-2000, the Somaliland ministry of finance reported that “95 per cent of the resource that finance the activities are locally mobilised, mostly through taxation”. Not only are taxes collected in a non-coercive manner… For example, in early 2000s the government attempted to increase taxes on the private sector and proposed a VAT rate of 30 per cent, but the business sector lobbied against it and the policy was reversed. …A number of aid experts have argued that heavy dependence on external assistance undermines democracy, creates a dependency culture, diminishes political accountability and makes the state more accountable to donors than its own citizens.Somaliland is an example that…the inhabitants of the Horn of Africa can still build functioning states. …Somaliland is a lesson to the world in how to achieve successful state-building without aid. Somaliland is far from a success story, and the article acknowledges big problems with drought, Chinese influence, and other factors, but at least there are some positive developments. The key lesson is that the absence of aid has a very sobering effect. And you know I get a “thrill up my leg” when I read about a place that fights against the value-added tax. So I’m crossing my fingers that Somaliland stays independent and begins to prosper. Let’s close by sharing a startling confession by a former senior aid bureaucrat in the United Kingdom. Foreign aid spending is “out of control” and the department responsible for it should be abolished, according to its own former minister of state. …Grant Shapps, who was second-in-command at the Department for International Development (DfID) until 14 months ago, attacked its “profoundly worrying” tendency to “shovel cash out of the door”. …Shapps, whose criticisms are unprecedented from a former insider, said he had “agonised” for more than a year about going public. …He described how, in the Foreign Office, he would protest to African dictators about their “denial of human rights and democratic values” but “then, with my DfID hat on, I would rifle through my red box [of ministerial papers] to find cheques for hundreds of millions of pounds payable to the same countries. …Money was thrown at wasteful multilateral aid providers, such as the European Union and the United Nations, to reach the required spending level. Too bad we don’t have enough ethical bureaucrats to blow the whistle on similar examples of waste and corruption in America’s foreign-aid system (though at least we have two former officials who were in charge of the federal government’s asset-forfeiture office and now say it should be shut down). P.S. Next time leftists want to make a satirical video attacking libertarianism, they should use Somaliland rather than Somalia. The abstract is devastating : -ve outcomes, how could that be?